You CONTROL the STORY in this high-quality, animated visual novel game from DUQUESNE WHISTLE! Take on the role of a wily, smart-mouthed scoundrel and embark on an epic journey across the vast fantasy world of Caldyyr. 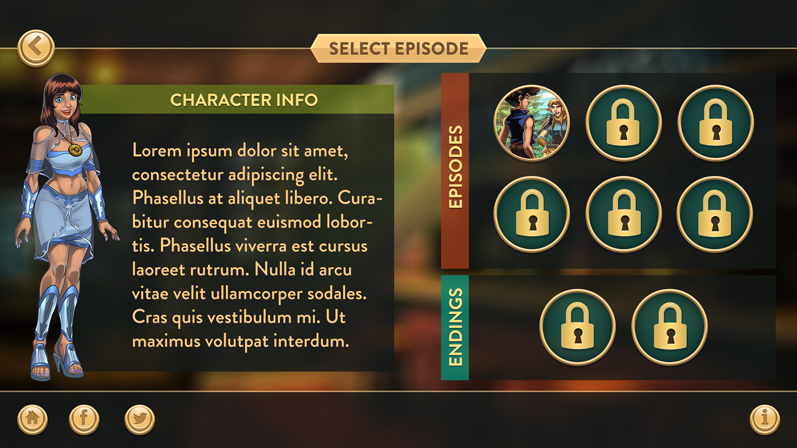 Choose from 4 unique story paths with a total of 8 possible endings. In a THIEF’s TALE, you’re the scrappy leader of a trio of bumbling burglars, down on your luck and hell bent on scoring a major heist. As an extravagant-looking caravan approaches, you and your pals hastily cobble together a harebrained plan and spring your trap. Appearances can be deceiving, however, and before you know it, you’re pinned by a pair of gorgeous, gritty women warriors, and swept up in globe-trotting adventure that will lead you on an unforgettable pilgrimage, full of twists and turns, and beyond your wildest imagination. LOVE & ROMANCE: A cast of memorable characters to choose from! Each leads you down a unique story path. ANIMATED CHARACTERS: Characters feel alive with changing poses, lip movement, and eye blinking! DIALOGUE CHOICES: Choose wisely! Some choices can affect your relationships with different characters. SPECIAL ENDINGS: Unlock special endings depending on the choices you make throughout the story! PHOTO ALBUMS: Play through the story to unlock special scenes you can add to your album. MULTIPLE PORTRAITS: Select a different portrait for your own player character. TOP-NOTCH QUALITY: Finely crafted stories, gorgeous visuals/effects, and music that will immerse you.